When Sector 7 (7광구) was announced, it came with a wave of anticipation. 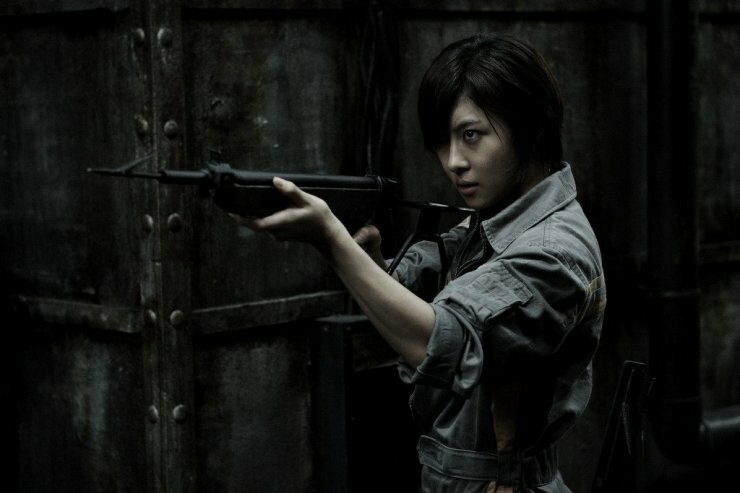 It had a blockbuster story that resembled Hollywood fare, guaranteeing a foreign market; it had assembled some of the most popular actors in the country, including hot property Ha Ji-won (하지원) also known as ‘the Korean Angelina Jolie’; and it was to be filmed in 3D, insinuating the high level of confidence film executives had in the project. The story, about workers on an oil rig that come face to face with a monster, had more than a few similarities with Ridley Scott’s classic Alien (1979) and had cinephiles wondering if it could compete in Hollywood and reignite international attention in Korean cinema. To be fair, the expectations were so ridiculously high that any film would have fallen short. But no-one was prepared for just how far short, and how awful, Sector 7 truly is. On an isolated oil rig off the coast of Jeju Island, the crew are experiencing difficulties as there is no oil to be found. The supervisor (Park Jeong-hak (박정학), wants to abandon the search but is repeatedly challenged by team member Cha Hae-joon (Ha Ji-won (하지원) for his cowardice. That is, until senior official Jeong-man (Ahn Seong-gi (안성기) returns to the rig and demands the search continues until an oil well is found; yet once their objective has been achieved, members of the crew are found dead. As the crew attempt to find the murderer, the come face-to-face with a monster from the depths of the ocean. The narrative itself is not an inherently bad premise, yet director Kim Ji-hoon (김지훈) continually pushes audiences’ suspension of disbelief well beyond their limits. For example, motorcycle drag racing on an oil rig appears to be a commonplace activity on this particular rig, as does the bizarre mixture of futuristic and archaic technology within it. The absurdity is not helped by the use of terrible CGI and green screen that seriously detracts an sense of logic to the proceedings. The worst is saved for the monster itself, an unbelievably poor creation that appears like a reject from a Final Fantasy video game. The monster has supposedly been forcefully evolved from a smaller creature yet bares no resemblance to it whatsoever, and exhibits an entirely different set of abilities. Luckily most scenes involving the creature are at night and in shadows, yet even then the lackluster design, movement, skin texture and so on are obviously apparent. 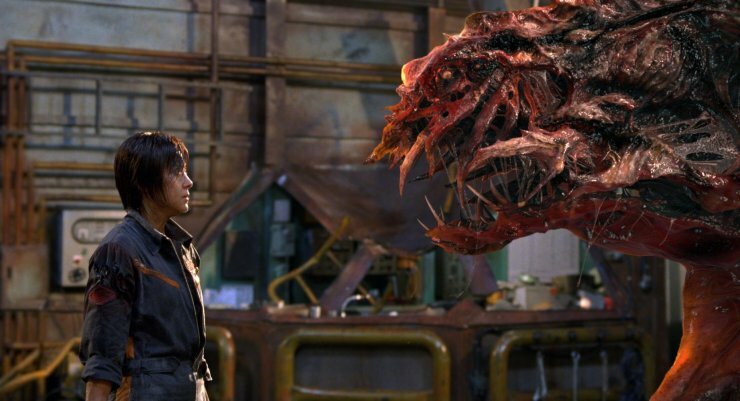 This is all the more baffling when considering Bong Joon-ho‘s incredible monster film The Host was made 5 years earlier. The actors portraying the tyrannized protagonists are also unimpressive, although they cannot be held fully accountable as the dialogue is woeful. Ha Ji-won is usually an actress that guarantees quality, yet even she provides an under-par performance as she schizophrenically flits from cute airhead to hardened independent woman. Her love interest played by Oh Ji-ho (as Kim Dong-soo (김동수) is so under-represented that he hardly warrants being in the film, let alone providing adequate interest as the source of her affections. Duo Park Cheol-min (박철민) and Song Sae-byeok (송새벽) are intended to add comedy to the mix however become so irritating that it’s something of a relief when they meet their demise. Park Cheol-min in particular shouts his way through his dialogue, while his compatriot merely whines. The less said about Park Yeong-soo’s (박영수) mentally ill crew member Jang Chi-soon the better. Only Ahn Seong-gi as senior crew member Jeong-man conveys credibility through his quiet-albeit-authoritative tones, yet he too succumbs to the oddities in the narrative when his supposedly true nature is revealed. Sector 7 is not a complete disaster, as director Kim Ji-hoon competently composes scenes and keeps the action moving at a swift pace. Apart from the awful CGI it’s clear that Sector 7 has a large budget which has been well spent on creating the mise-en-scene of an oil rig. It’s a shame that so many negative features outweigh the few scant positives, rendering a potential blockbuster into a substandard film well below the talents of all involved.